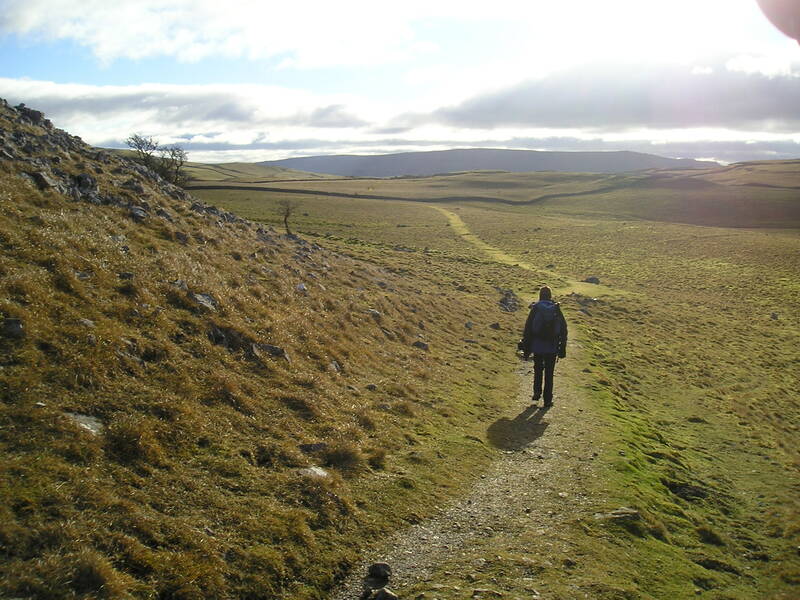 ← #8 – Great Whernside …Underground, overground. 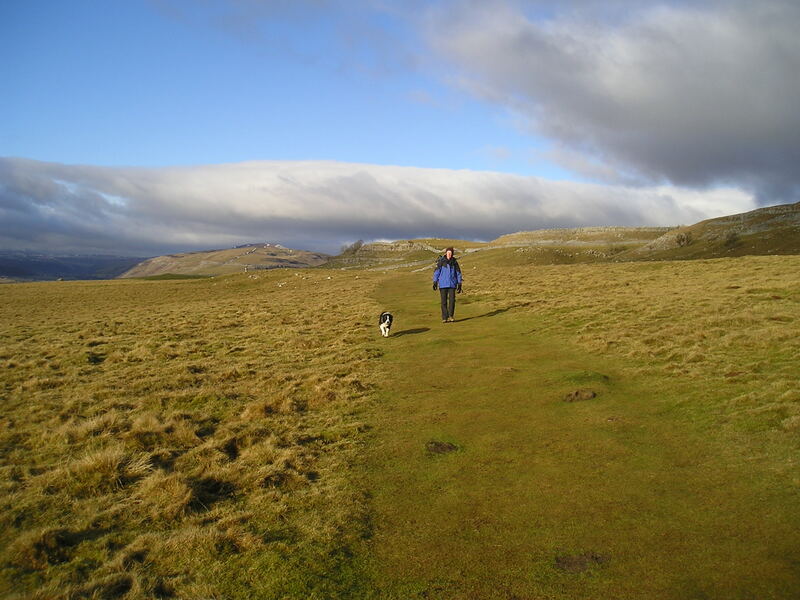 11 January – A week after the Great Whernside mini-epic, Chris wanted a less exciting walk. 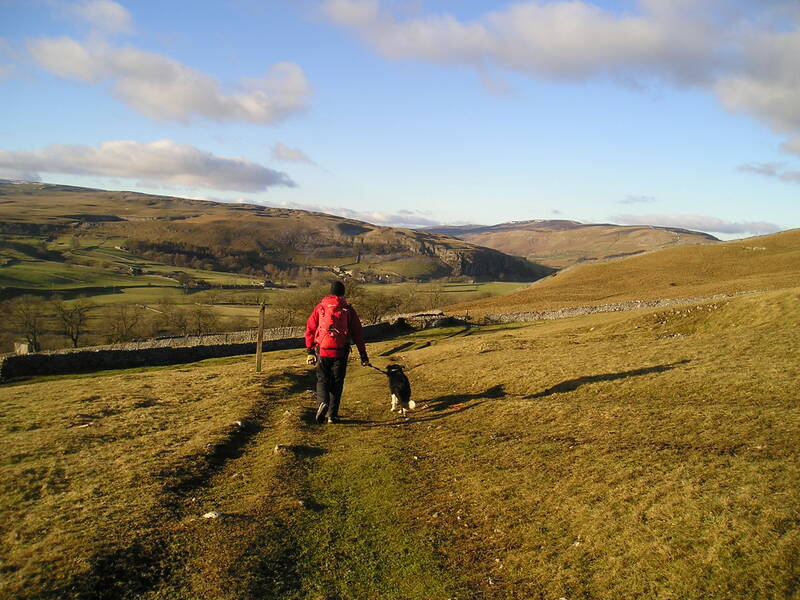 We chose the route we should have done last week., starting from Conistone, heading up Conistone Dib, then taking the Dales Way to the edge of Grassington before returning along the top of Bastow Wood – shorter, lower and much less affected by bad weather than last weeks walk. Mind you, one four-legged member of the party was in for some excitement. "Hmm, these stiles can be tricky!" Border Collie “Mist” has been with us for a month now, but just as we got her she came into season, so for the first three weeks walks were all on a lead, with a careful watch kept to avoid potential suitors. We started recall training in a fenced tennis court, and then after three weeks had her off lead in the local park with good results, a dog that doesn’t wander too far away, and comes on recall. "... just a walkin' the dog!" The next step was to try her without a lead on the hills. A bit more nerve wracking for us, because if the dog was startled by something she might run, though the evidence so far was that she would stick to us like glue. Still, at least the high ground was clear of sheep, and the Conistone walk would be ideal. There was still the thought, however, that no matter how certain you are about a dog, they can sometimes surprise you. Re-wind twenty-five years. Penrith Mountain Rescue Team is on a winter training exercise, with about twenty members and two search dogs. The radio crackles into life – an ice-climbing accident in the next corrie. We set off at a good pace, working round the base of the ridge between us and the incident, all out of breath but trying to keep something in reserve. Suddenly a loud noise from behind. An RAF Sea King helicopter, callsign “Rescue 131”, is hammering up the valley towards us. Graham’s dog “Rick” flees downhill with Graham trailing behind – it would be almost a mile before he caught up. Meanwhile my dog “Matt” is also running, but running uphill, the same way as “Rescue 131”, heading towards the incident. We arrive to be told that the climber has died. “Rick” was a well-trained, obedient dog, probably a bit brighter than my “Matt”, but after this he hated helicopters, and became nervous about all loud noises. “Matt”, on the other hand, was blasé, and would leap aboard a helicopter as if it was the family car, before curling up under the seat behind my legs. Why the dogs reacted so differently is still a mystery. “Mist” is sometimes nervous of new situations, but the helicopter we could hear nearby during this walk didn’t seem to bother her. In fact, we all had a great day out, with the cool breeze tempered by a warm sun. For Chris and I it’s a walk we have done several times, but which still holds interest. The dog certainly had a great time – from now on the walks in the park will probably seem to her like, er, …a walk in the park…? p.s. – Thanks to my regulars for continuing to follow this. If you enjoy this weekly wander in the outdoors you can subscribe – costs you nowt, and you get an email when the new posts go live. Just click the “Sign me up” button on the right side of the posts. This entry was posted in 3. 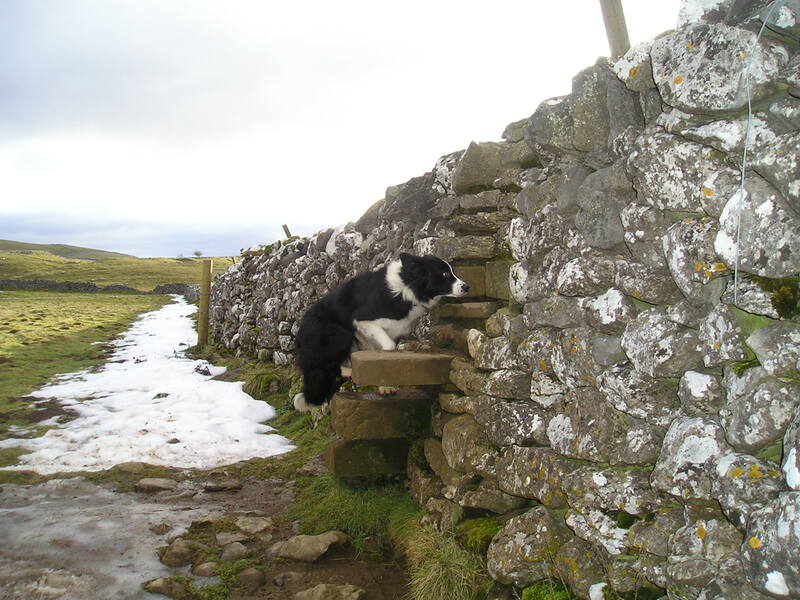 Yorkshire Dales and tagged Border Collie, mountain rescue. Bookmark the permalink. Ref. the helicopters and other noises – I generally find that, even if they’re load, if they’re not sudden, most animals totally ignore them. And some animals even ignore the very suddenly loud – like sheep totally ignore fast jets on training. The ‘copter obviously just made the poor dog jump! whoops – must spell-check – I meant loud, not load above! duhh!